Several expense accounts possibly including miscellaneous charges expense, sales tax expense, and freight charges expense. If you are using the General Ledger package and the Accounts Payable package, you may control where the Accounts Payable package will find the appropriate account in A/P Setup. 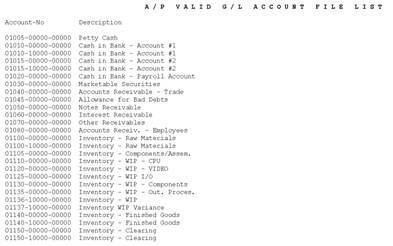 If you choose to have the accounts verified from Accounts Payable then the A/P Account File stores the numbers of all the accounts that will be directly affected by Accounts Payable. A description for each account is also stored. 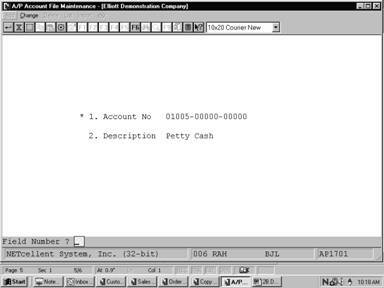 When an account number is entered from within the Accounts Payable package, it is checked against this file. If the account number is not found, the entry is invalid, and the operator must enter a different number. If the account number is found, the description is displayed on the screen so he can see if this is the intended account. This greatly reduces the number of operator entry errors that occur on account numbers. 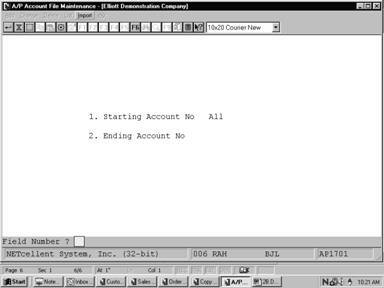 The format of the account number is variable. It can be a single number of from one to eight characters, or it can be a triple number with a hyphen, each number having from one to eight characters. 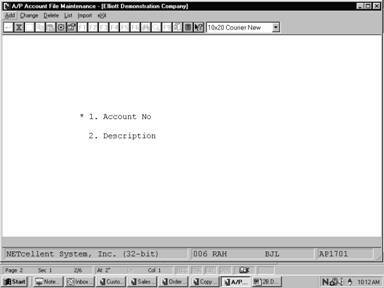 See the System Manager manual for a full description of how to set up your account number format. The Import application will allow a range of accounts from the General Ledger Chart Of Accounts File to be imported into the Accounts Payable Account File. This selection appears only if the Elliott General Ledger package is installed. Enter the account number from G/L. In the change, inquire or delete modes, pressing the F7 key will allow you to search for the main account by number or pressing the F8 key will allow you to search for the account by description. 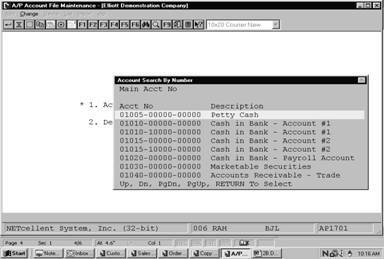 Enter a description of the account number, which will make it clear to the operator at a glance whether or not he has entered the correct number. Enter the beginning of the range of accounts that you want to list, or press the RETURN key to list All accounts. Enter the end of the range of accounts that you want to list. This field defaults to the starting account number to facilitate listing a single account number. This question and the next one (Ending Account No) allow you to specify a range of accounts to be imported from the G/L Account File. If you press RETURN for the entry of the Starting Account No, the field will default to All accounts, and the entry of the Ending Account No will be skipped. NOTE: If you have to change a description of an account in G/L and try to import it into A/P, the description will not import. 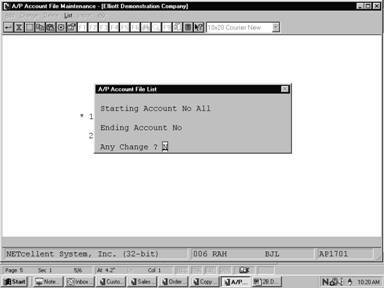 You must first delete the account in A/P, then import.